There has been surprisingly little written about the Serpent Goddess and so I was delighted to receive this book for review. It’s a fascinating read, covering a huge amount of ground, both in time - from the Primordial Serpent Goddess right up to the present - and in space, encompassing the world. The book is interesting and engaging and - a huge bonus for me - includes a long list of goddesses associated with serpents, from Abduk (of whom I had never heard ... a goddess from Dinka myth, southern Sudan) to Yunan (who I'd also never heard of, from the Munggan people of northern Australia). The book is descriptive, beginning with an introduction looking at the suppression of Goddess worship and how the serpent became a symbol of evil after having originated as a symbol of the cycle of life, then becoming associated with prosperity, healing, prophecy and more. It would seem a little curmudgeonly of me to want more of this – but I did hope for more detail, perhaps we can look forward to the next book for that! I was inspired by the representation of serpents with some of the most ancient strands in the story of Goddess that is slowly emerging, thanks to the scholarship of so many like the author. She has some wonderful insights into familiar myths, too and often points out something I missed …. for example, I’m familiar with the story of Inanna and her descent, but what of Ninhursag, the Sumerian Mother Goddess or "Mistress of Serpents, and how Enki, her consort, ate the eight sacred plants she had created, for which Ninhursag cursed him by withholding the "eye of life" from him, but later relented and birthed eight healing deities, each curing one of the organs that the plants had been made to afflict. One of these deities, Ninti, was known as the "lady of the rib" or "the lady who makes live", maybe connecting with the story of Eve in Genesis? I had heard of the tale in the Zohar, a Jewish mystical text from the 13 century CE, in which Eve mated with the serpent and later gave birth to Cain. The text does not, apparently, specify that Cain was fathered by the serpent, but the idea is planted, thus demonising Cain even before the famous murder. Another goddess I knew little about is Damona, whose carved image near a spring in Alesia, Burgundy, shows her crowned with wheat and with a serpent encircling her hand, recalling Demeter. The author looks at both faces of the serpent goddess, both as life-giver and life-taker. There are, of course, many examples of goddess with dual natures, both single goddesses and pairs ... Inanna/Ereshkigal, Athena/Medusa being but two. Other goddesses retain both sides within themselves - eg Hecate and Ix Chel. There's a story of Inanna and a serpent of course, but also Ereshkigal was associated with a constellation known as the Serpent and was often viewed as a serpent herself. I asked Linda if she’d be interested in publishing an extract from the book in the next (Spring 2012 issue, and am delighted to say she agreed … so do look out for that! 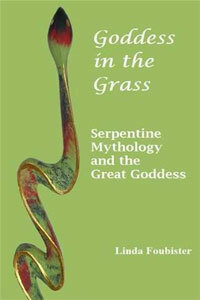 Goddess in the Grass is an e-book, published by Spirrea Publishing. There was a print edition of the book in 2003, by Ecce Nova editions – this may still be available from some booksellers.